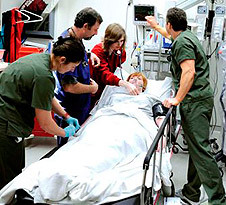 Although the demands placed upon those caring for the injured patient are frequently high, the gratification of witnessing good outcomes in persons who would otherwise be permanently disabled or worse from trauma, is what motivates those who care for the injured. We at United Regional are no different in this regard. 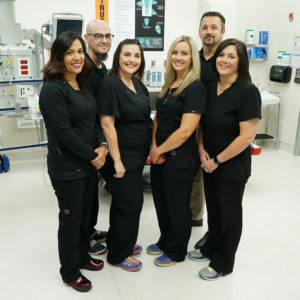 This organization and its medical and nursing staff, along with those in many other care areas, have collaborated to create a truly outstanding trauma system. Working with pre-hospital care personnel, law enforcement, rural facilities, and the North Texas Regional Advisory Council on Trauma, we have developed a robust and structured process of care for the injured. The extent to which this system improves outcomes is a measure of our success. The Trauma Service at United Regional takes great pleasure in presenting its annual report. We are thankful to the many and diverse people who make the system work. Not least of which are the surgical specialists who provide definitive care to trauma patients. We are grateful. As Director of Trauma/Acute Care and Hospital Preparedness, Jacky Betts, RN, BSN LP, TCRN is responsible for the overall direction and management of the Trauma/Acute Care and Preparedness Programs. Jacky has extensive experience in trauma, emergency medicine, and critical care. He has led United Regional through three Level II trauma designation surveys, and also conducts trauma designation surveys at other facilities. He currently serves on the board of the North Texas Regional Advisory Council for Trauma, officer of North Texas ENA Chapter, treasurer for the Texas Trauma Coordinators Forum, and presiding officer of the Wichita County Child Fatality Review Team. Mr. Betts is also the course director for TNCC and ENPC classes. He is a visionary leader in the trauma field across the region and state. As Trauma Educator, Laura Pressler, RN, TCRN is responsible for providing trauma education, injury prevention and outreach to United Regional and the surrounding areas. Laura has extensive experience in emergency nursing and trauma education. She is the Education Committee Chair for the North Texas Regional Advisory Council. She serves as our region’s representative in injury prevention for the Texas EMS Trauma and Acute Care Foundation. Laura is also an active instructor in ACLS, ENPC and TNCC. Trauma Nurse Clinician, Elizabeth Johnson, RN, BSN, is responsible for collecting performance improvement data. She visits trauma patients in the hospital on a daily basis, reviews progress, and makes personal contact with the family when appropriate. Elizabeth also oversees the Trauma Clinic where patients return for follow-up visits after being discharged from the hospital. Elizabeth is involved in assisting in various injury-prevention efforts. Trauma Registrar, Rob Ratliff, is responsible for collecting data and entering it into the Trauma Registry. He is accountable for event coding and injury severity scoring. Rob writes reports, runs all trauma statistics on a regular basis and can provide groups with trauma data upon request. He is a member of the Injury Prevention Coalition. Trauma/Acute Care Administrative Assistant, Aubri Austin, is responsible for Trauma/Acute Care clinic scheduling, trauma billing and operations. Aubri is a Certified Child Passenger Safety Technician and is also a member of the Injury Prevention Coalition. She also serves on the Environment of Care Committee. Acute Care Nurse Clinician, Amber Hill, RN, is responsible for monitoring performance improvement data. She visits acute care patients in the hospital on a daily basis, reviews progress, and makes personal contact with the family when appropriate. Amber also oversees the Acute Care Clinic where patients return for follow-up visits after being discharged from the hospital. Amber is involved in assisting in various quality/patient safety efforts.